In this video released today, fighters from the group appear to have designed a new and unique multiple rocket launcher system (MRLS). 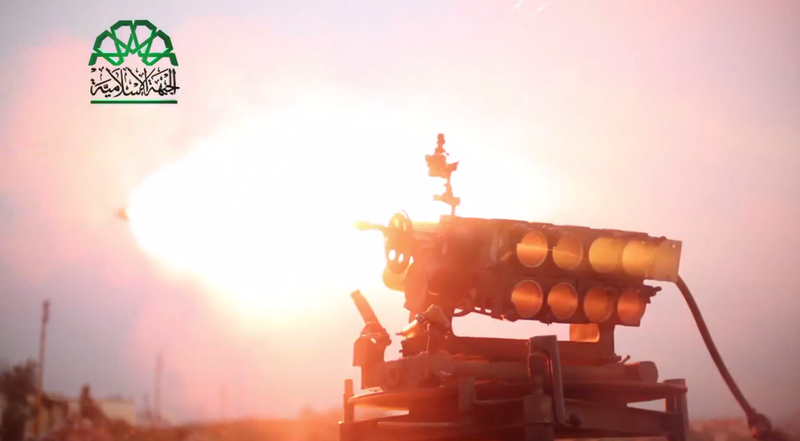 This new weapon appears to fire Katyusha-like rockets in a 2x4 rack. As well as this, it appears to be able to swivel on a rotating mount, and has fully adjustable firing angles. In the video militants are seen using an iPad (or similar tablet) in order to generate precise firing angles. The full system appears to be part of a trailer, suggested it can be easily towed around the battlefield. The Islamic Front makes wide use of such improvised weaponry due to its lack of external supply. Other such weapons used by the group include homemade anti-material rifles, as well as the now-infamous “Hell Cannon” - an improvised large caliber artillery piece that fires large homemade bombs more than a 1km.